November 15th. Pouring rain in Seattle. So soon after the Election Shock. There was a Spec Fic reading at the Vermilion Bar in Seattle. I attended, mainly for a chance to meet some of the writers I knew, and see them in action. I went up to get a hot drink and a snack. They had no coffee, only tea. While I waited at the bar, a man next to me asked me if I was a writer. His name, he said, was Don, and he didn’t give a surname. I asked him the same thing, and he said something about having a bookshop. Then he asked me to give him three words, and he’d write me a poem. Without thinking too much about it, I gave him Balloon, Phoenix, and Rocket. My food arrived, I excused myself, and took it back to the table with my writer friends. A little later, he brought me the poem. The reading had started, and so I just glanced at it and thanked him. Later, I read it, and it seemed an extended metaphor for the political dream that became a nightmare. and pull up the blanket under my chin. “Do you like it at all?” he asked. Yes. I did. I do. I pulled up the blanket under my chin. What else was there to do at 3 a.m. when it had all gone wrong? I still don’t know, as I look at the handwritten poem on a scrap of paper, whether that was what he meant. But that’s what it meant to me. I was sitting at the computer pulling an all-nighter, and it was past dawn. I was thinking of calling it a day (or night), when I heard a crash of glass from my bathroom. Damn. Expecting a picture off the hook or a shattered toothmug, I went to investigate. 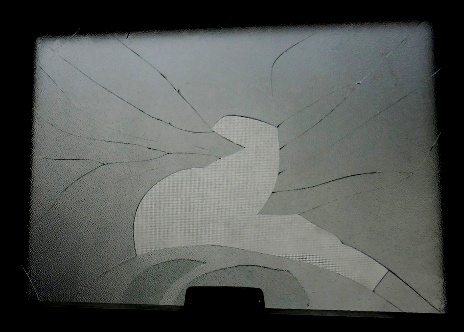 The upper panel of the bathroom window had smashed. Pieces of glass lay all over the floor. It’s a double-paned window, and the external pane was whole. So – maybe I have a poltergeist? Or is it a message from my long-neglected Muse, because the broken window? It looks like a phoenix on its nest. Then again, it could be thermal shock (though I didn’t notice any serious temperature change) and pareidolia. I’d be interested in other explanations (preferably scientific, but open to anything).